Lancashire have announced a record operating profit of £3.5m for the year ending December 2013, after posting a loss in the previous four years. The club also doubled its revenue to more than £19m, helped by the return of Test cricket after a three-year gap. "There are a raft of different reasons for it," financial director Lee Morgan told BBC Radio Manchester. "The biggest one is clearly getting Test cricket back to Emirates Old Trafford, and the Ashes in particular." England retained the Ashes with a draw in the third Test against Australia at Old Trafford last summer. A £45m redevelopment of the ground was completed in time to stage the third Test between England and Australia in August, as well as a one-day international between the teams a month later. Morgan continued: "We've had four years of major disruption. In the previous year, we had two-thirds of the ground under construction with a reduced capacity. "We've been able to grow our sponsorship revenue significantly because of the completion of the ground, and also the concert and events business is growing significantly." 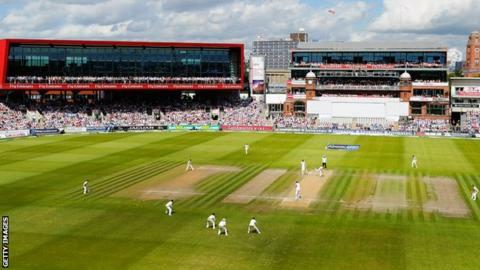 Lancashire, who despite the profit remain around £13m in debt, will host further Test matches in 2014 and 2016. Meanwhile, the club's domestic revenue increased by 36% and they hope it will continue to grow after achieving promotion back to Division One of the County Championship.